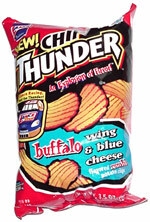 Taste test: Chip thunder, indeed! These rippled chips are extremely crunchy and also very flavorful. They really do taste like Buffalo wings with blue cheese. They've got some good kick to them. An excellent chip. Smell test: Very hot and spicy aroma, sort of like Buffalo wings. This snack was discovered by Jeremy in Maine.